Major revision in progress ... Please come back later. 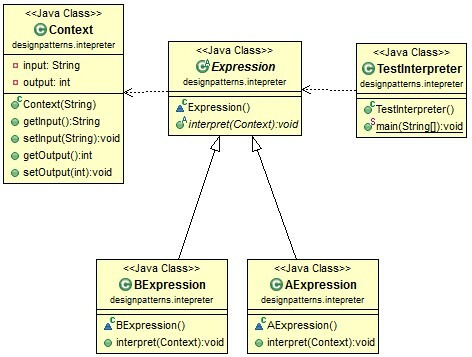 Interpreter pattern is used when some context needs to be interpreted. The following example is a very simple Interpreter implementation. It interpretes letter "a" and "b" to "1" and "2". Note that: the dependency is also shown in diagram to make the structure more understandable. i think it’s strategy pattern . Context adds complexity that beats the complexity of Interpreter itself. Pehaps you should reconsider it. I’d recomment to dump the Context class completely, as it serves no purpose but to keep a two-character string. Additionally, the example does not show how expressionA interprets “a” as “1”, it just interprets “whatever symbol is now first in the context input” to “1”. expressionB does the same, interpreting anything to “2”.